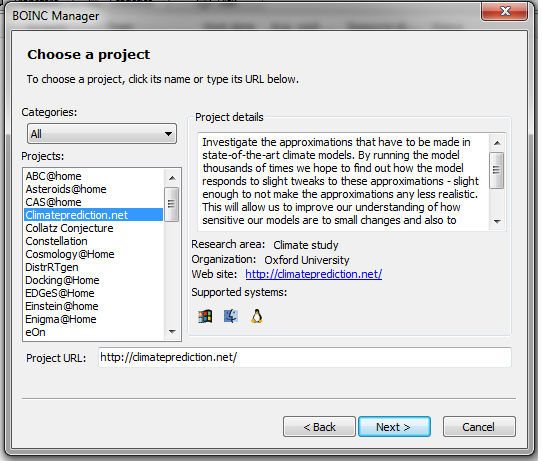 Climateprediction.net runs on the BOINC client – this is a generic platform for distributed computing, which you can use to run a number of different projects. In order to run our project, you will need to go to the BOINC website and download the client. You will need to wait for a moment while the client contacts our server. Now you’re running climateprediction.net on the BOINC client, you need to set up an account (if you don’t already have one), so you can manage your preferences and so the project can keep track of the models you’ve run. If you are a new user, select “No, new user” and enter your email address and choose a password. We won’t use your email address to send you unwanted emails, and we won’t give your email address to any third parties, click “next”. You will then be taken to the “Find a Team” page. Teams are a fun way to engage with the project, but are not required. If you want, you can just hit the “I’m not interested in joining a team right now” link for now. You can always join a team later. You will now be taken to your user home page, where you can see your project settings. There are 2 ways to change your settings with BOINC: in the BOINC client, or from your user page. If you change settings in the BOINC client, then those changes will only be for that client on that computer; if you make changes on your user page, then those changes will be for every computer that you install BOINC on, and log in with that user account. For many users, these 2 options will amount to the same thing. 7. Get help, and get involved! If you have any problems with setting up BOINC and running the project, please read our Technical FAQ to see if we have already answered your question. If not, why not visit our participant message boards, where you can see if someone else has had this problem before, or you can ask a new question to the other volunteers. The message boards are also a great place to get more involved with the project by discussing your model and other climate change news with the other participants. You can also keep in touch with the project on Twitter and Facebook. You can see a visualisation of your model in the BOINC client – in the advanced view, go to the “Tasks” tab and click on a running model. To the left, there is a “Show graphics” button. Click on this to see a visualisation of this model. There’s also a BOINC screensaver, which will show you the visualisation when you’re not using your computer. In Windows 7, right click on your desktop and select “Personalize” and then select “Screensaver” from the bottom right of the window that pops up. “BOINC” should appear as an option when you choose a screensaver. Please click here to go to the climateprediction.net BOINC user pages.